I was invited via Klout to participate in a Yoplait yogurt promotion, but it wasn’t entirely clear at the sign-up point what would be involved. A few weeks later they sent a cardboard box designed to do a blind taste test between their new Greek yogurt and a competitor. The package also included a $4 gift card toward the purchase of the two yogurts. When it arrived I was swamped with previous commitments so it took me awhile to get to it. Further, my local grocery store didn’t carry the specified competing product (Chobani Greek bluebrry yogurt) except in gigantic multipacks that far exceeded the $4, and given our family’s recent conversion to Noosa yogurt, I was fairly certain if I bought the megapack of Chobani it wouldn’t get eaten. So instead I opted to taste test the Yoplait Greek blueberry against Wallaby Greek blueberry yogurt since that was the closest style competitor my grocery store carried. Today I set up the cardboard taste test box with the two samples inside, each taken out of their cups and presented in identical Bento cups. I then had my husband and eight year old daughter – both of whom really like blueberry yogurt – test each type. 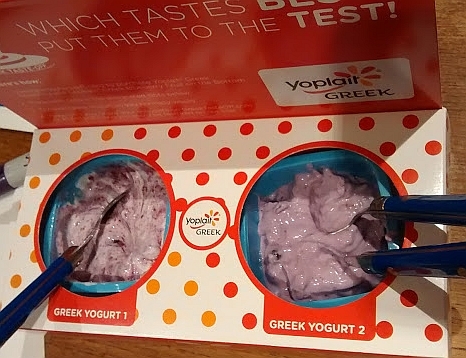 The Wallaby Greek Blueberry Yogurt is on the left, the Yoplait Greek Blueberry Yogurt is on the right. I then tried them both, but given the obvious difference in colouring and smell there was no way I could do the test blind. I tried the Yoplait first and found it painfully sweet with an unpleasant chalky after taste. Then I tried the Wallaby and found it much less sweet with a nice tartness but it also had an after taste I didn’t like. I’m not keen on blueberry yogurt anyway, and to be honest, I wouldn’t eat either of these. So our family conclusion is my daughter likes both with a preference for Yoplait, my husband only likes the Wallaby, but both still prefer Noosa so we won’t be buying anything other than that anyway. And if I was going to eat yogurt it’d be Stonyfield strawberry because I only like strawberry and Noosa doesn’t have strawberry alone. PS For the baby’s input on the entire thing, see this G+ post for what I’ve been doing with the outer cardboard packaging that the kit came in.